By chronological order, this post was supposed to be posted before the Pontiac G6 GT post but I had to hold it back as I was waiting for a reply from Will. Anyway, I was tracking the flight path of my path as it started to make its descend as it approaches LAX. 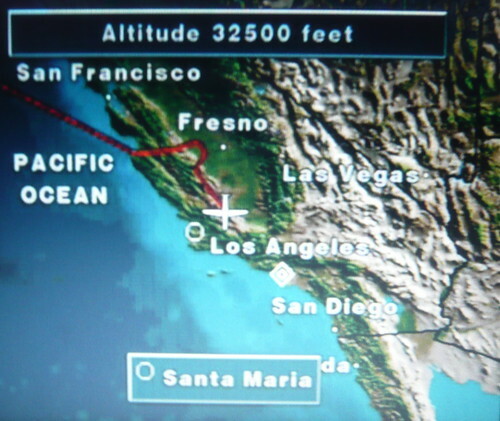 What I noticed was that as soon as it entered the mainland USA, it made a right turn towards Fresno (see red line depicting flight path in above picture) before looping right back to original line of approach as if there was something there that the plane had to get around. So, I took a picture of the screen in front of me and email to my good SQ Pilot friend whom holds the answers to all my strange questions like "what do planes land exceptionally harder during rainy weather?" or "why must we keep all windows open during take-off and landing?" 1) Most likely to have some military or civilian paraglide/parachute jumping activities. 2) Another possibility is that this approach lines you up to Runways 24L or 24R, facing a bearing of 240 degrees towards the coast where the prevailing winds are blowing from. 3) This also facilitate Air Traffic control in which DEPARTING aircraft takes off toward the coast. Minimise conflicts. Interesting..... I learned something new today. By the way, I love your Birthday Greets chalkboard tool under Jay Shouts. Where can I get it? Not too long ago Channel 8 had this show called Bu Shuo Ni Bu Zhi and according to them, the reason why the windows have to be open is so that the passengers can see what's going on outside in case of an accident. Google results show a variety of answers too. Elvina: Like I said in my tag board, I just anyhow grab a blank chalkboard image and the fill in the rest of the messasge and/or doodle in myself. Desperate Addict: Welcome to the blog! You are right as far as what my pilot friend said. Apparently, the take off and landing are the most dangerous parts of the flight. hiaoauntie: I would have agreed with you on the lining up in to formation to get in line to land if the "detour" were nearer to the airport. In this particular case, the detour happened around Fresno which is about 225 miles away from LAX which probably rules out your rationale. Wah Tio Si Magic Pony Liao!